... and then I found myself on the couch during New Year's Eve with a really bad movie. 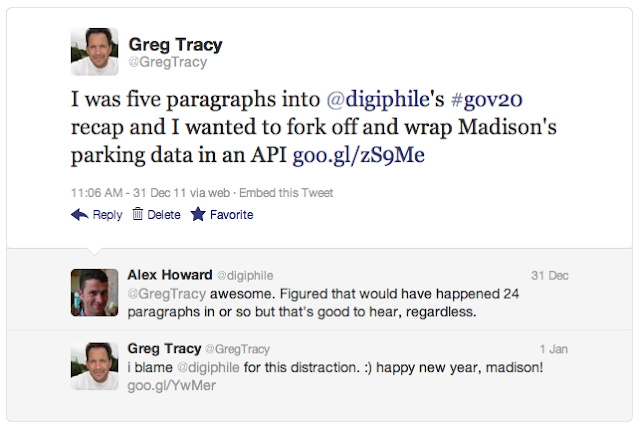 Laptop out... in the wee hours of the New Year, I released a new web service for Madison. 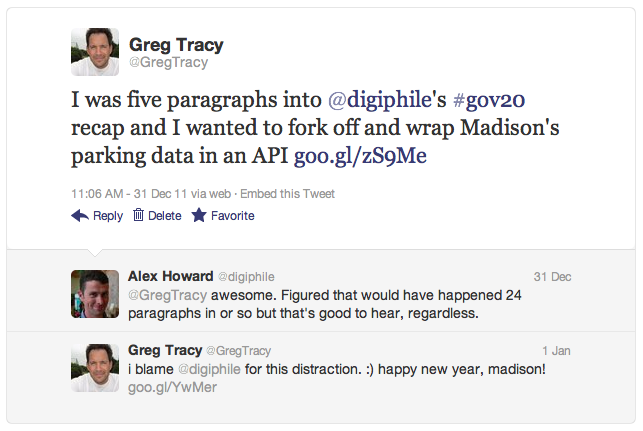 It provides a simple JSON wrapper around Madison's recently released data for parking availability on the isthmus. I added it to the list of services available in the SMSMyBus API. ... but what I really hope for, is that others take this and build something creative with it. Although it's great to get so much positive feedback from the Madison community on these little projects, it's really (really) important to recognize that the work I've done with the API is going in the wrong direction in many ways. I'd rather be building the apps on top of services created by Madison. Eventually, this great city of ours needs to stop building websites and start producing the core feeds that I've done. That's the foundation. That is the government as a platform.